I have been really busy lately…busy trying new restaurants. Spring has sprung and I suddenly have this sense of renewal. I wanted to go outside again! I wanted to find a new restaurant to add to my top spots. I realize that I may be a little picky, making this task more difficult than it sounds. Its so hard to find a restaurant in Montreal that has it all. If the food is great, the service isn’t or vice versa. We always end up at the same old haunts. You can be sure to find us either at Da Emma, Le Gourmand, Cafe Ferreira or Milos. We surely won’t stop going there but I am on a quest to find another great one. After all, we’re supposed to be one of the top foodie cities in North America! As if on queue, my sister-in-law showed me this great little book called “100 Restaurants creatifs a Montreal – 2e edition”. She lent it to me with an assignment. She asked that I try the restaurants from the book which interested me and write little notes in it about my experiences. This gave me my needed starting point. I looked through the book, researching the restaurants on-line, comparing various reviews. So, I chose a few….like, 10! 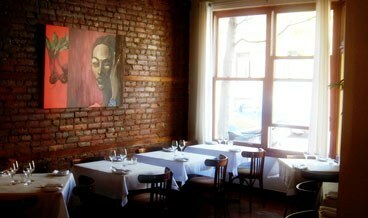 Casa Mono, Mario Batali’s Tapas restaurant in New York renewed my faith in Tapas restaurants. I read all the favourable reviews about Pinxto on every single site and thought that maybe…just maybe, we could have our own Casa Mono right here! Pinxto is located on Roy Street East, Montreal. Its a quiet area, slightly sketch for my suburbian-self. It was very nice, rustic looking with beautiful colorful artwork on the walls – a glass wine cellar in the center. The menu listed various “Pinxtos” which is the Basque word for tapas. (Basque country is in North Eastern part of Spain.) Every single one sounded so good. We asked how many we should have each and the waitress explained that if you’re not having a main, you could have 10 Pinxtos each! If you’re having a main, you can have about 4 each. The price of the Pinxtos ranged from about 5 to 10$ Many were on the lower end of the price scale so its pretty affordable to go mental. We decided that we’d have mains, my husband chose….uh! I won’t even say it cause you already know!! I chose to have Black Cod served with mash and chopped raw cherry tomato on top. As for our Pinxto’s it was hard to narrow it down. We went with the salmon tartar, comprised of both smoked and raw salmon, a fig stuffed with cheese and topped with matchsticks of Serrano ham. We also had the fois-gras torchon which was so good! I was surprised at how much I liked it since I’m not a fan usually. We also had the Spanish charcuterie dish, which did not contain the much loved Serrano ham. It had something resembling italian soppressata instead. Hot and smokey or mild. Lastly , we had white asparagus wrapped in …yes….Serrano ham. I had to have it, ok? We enjoyed every single item we chose. The salmon tartar was slightly boring though. It needed lemon or something. It was blah. The bread and olive oil served was so good! The bread was warm and the oil was flavourful and bright green. The wine was a private import, selected by our server since we are unfamiliar with Spanish wines. We like whites with a round flavor. Nothing too dry or too citrusy. She chose a wine called “Dido”. It was amazing, like nothing we had tasted. It was well balanced too. I would return just for that! If I could, I would buy a case of it and guard it jealously in my cellar. Our mains were disappointing. I found my cod to be under-cooked and just “ok” tasting. My husband felt the same about his filet mignon. I guess when you go, just enjoy the Pinxtos and the wine. Its fun and ever-changing. Not crazy about a certain Pinxto? Don’t worry. You’ve got something else coming… Its so nice to chit-chat, tasting dish after dish and sipping wine. It adds to the conversation and it feels kind of serene. The service was courteous and professional. I give this restaurant a 3.5 on 5 and will return to have that wine and lots more Pinxtos!! I hope you enjoyed these reviews! Have a great week!